I'm a big believer in serums as an integral step in my skincare regimen as they usually contain a higher concentration of active ingredients to help address certain skin concerns. 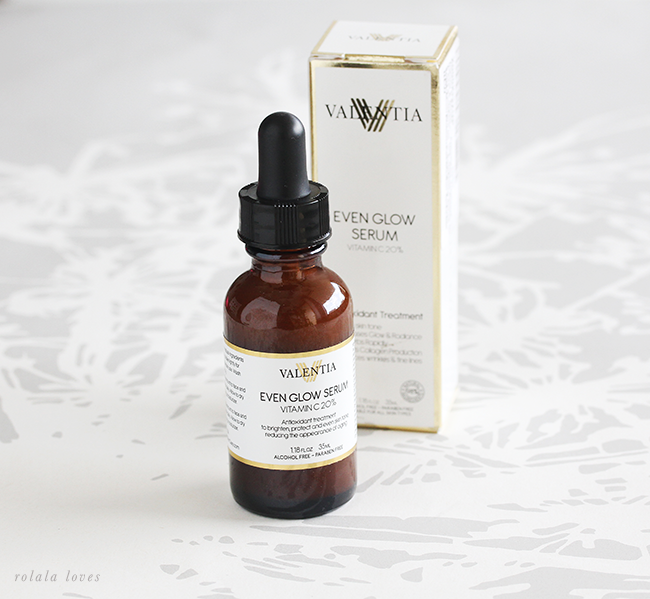 I was thrilled when I had the chance to try out this Valentia Even Glow Serum which claims to repair, refresh, renew and restore evenness to your skin. About the Brand: Valentia Skin Care aims to provide consumers with a greater level of overall happiness with their appearance by creating strategic formulations with powerful natural ingredients that have been scientifically proven to succeed in giving skin a natural and radiant glow that contributes to a youthful look. Key Ingredients: 20% Vitamin C to promote and protect the skin's natural processes, Organic Rosehip Seed Oil for anti-aging and skin rejuvenation, Organic Sea Buckthorn Oil to provide potent healing antioxidant effects, Resistem (Plant Stem Cells) to reduce inflammation and promote faster skin tissue regeneration, Hyaluronic Acid (Botanical) to promote and help moisture retention, Green Tea Extract to contribute to the overall antioxidant and anti-inflammatory benefits. Packaging: A dark amber glass bottle with an elegant looking white and gold label and box. The product is dispensed via a dropper which I love because it's easy to control and hygienic. Price: Usually $85 but currently on sale for $35 through Amazon for 1.18 fl. oz./35 ml. My Impressions: I've been on a lucky roll with not having any reactions with new skincare products lately so this serum had a smooth transition into my routine. It is a yellow orange color with a light natural citrus scent and the consistency of a viscous lotion. I've been applying it twice a day in between my toner and moisturizers. The product absorbs easily with a smooth finish and wears just fine under my moisturizer, BB cream and sunscreen during the day. After a little more than a week and a half of use, I can already see a slight improvement in the smoothness and clarity of my skin. However I was most impressed by how this seemed to help clear a breakout that I was on the verge of getting. It kind of just went away and that was pretty cool. Given the results I've experienced so far, I plan on continuing use of this serum. I can feel good about using this as an antioxidant treatment knowing that the natural ingredients are positively benefiting my skin and I wouldn't mind some continued improvement as well. Valentia Even Glow Serum is sold exclusively through Amazon and it evens comes with a 90 day money back guarantee. To learn more about the brand and their products, visit Valentia's website. Do you use serums in your skincare routine? Disclosure: A complimentary product was provided for the purposes of this review. There was no other compensation and all opinions expressed are my own. This serum sounds like a winner. I have really been into serums lately. Serums are da bomb, and this one sounds really great, Rowena. The Vit C is such a vital component of a skin care regime IMO. Serums are always a good choice. Great review dear. Great review now I want to try these product thanks for sharing. Thanks for the review! it definitely sounds like it delivers what it promises. Thanks for the comment on my feed being crazy. I think it is fixed now and Bloglovin' is looking into it as well. Please let me know if you still don't see it! Here is to hoping you get more cool skincare products soon! sounds like such a necessity for a good skin care routine! I just got a similar one, but this one also looks great! I don't use serums on my skin care routine, but this one seems like a great product. great review! I love the packaging. I actually use a couple of serums, and mostly essential oils and other natural skincare. This sounds interesting/. Serums can definitely make a difference. Have a great week Rowena! Oooooooooooooo I want it. Sounds fantastic. I love serums and oils. I would like to try this serum... perfect review Rowena!!! I occasionally use serums. Not sure if I believe in their effect. I tried the one by Estee Lauder but I didn't really notice any particular difference. Oh WOW that is an awesome price. I just may look in to this as I do wear serums in the winter. Thanks for the heads up. I haven't heard of this before but I am a big fan of serums and I've been using a Clinique one for some time now. I haven't heard of this brand, but it certainly looks like a good buy. I'm a fan of serums too, dear! Really interesting I really want to buy it after read this post. Can't believe it help clear up break out as well. Do you know whether it send to UK? Wow, this sounds like a great serum! I love serums! I haven't committed to one, but this sounds wonderful. Glad it prevented that breakout Rowena! Wow! I have not heard of this brand but I do think serum is crucial in a skincare regime! Glad that you have found one that you love and works well with your skin. It does sound good for the natural ingredients contained here and I love the simple packaging!